Super fun sketch, so I pulled out some new Reverse Confetti goodies! The papers are from Heidi Swapp's Favorite Things collection. 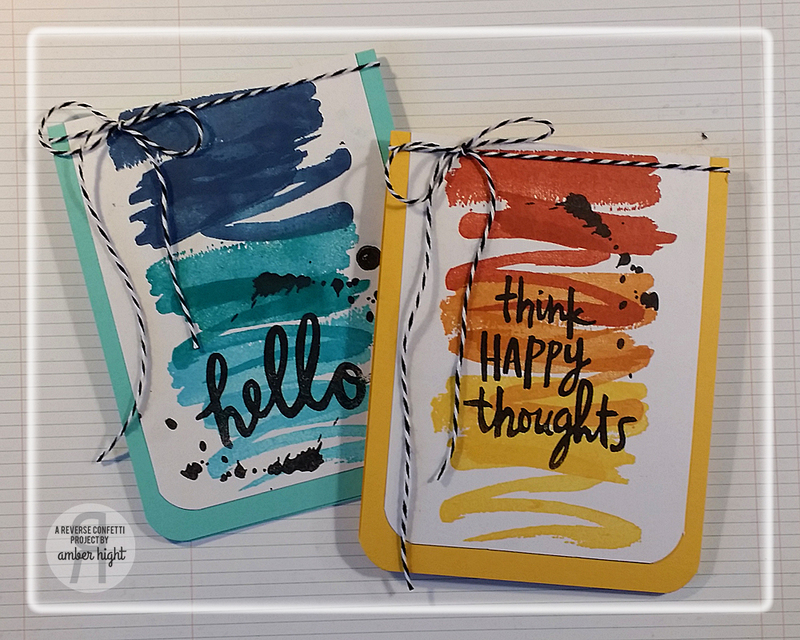 The "happy" is from a sentiment in Color Me Happy. I masked off the rest of the sentiment so I'd only get the "happy" and inked it up in black ink. 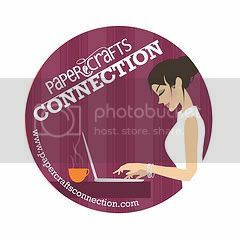 Then I tore the masking tape away from the stamp and stamped on a banner from the new Layered Banner Duo Confetti Cuts. 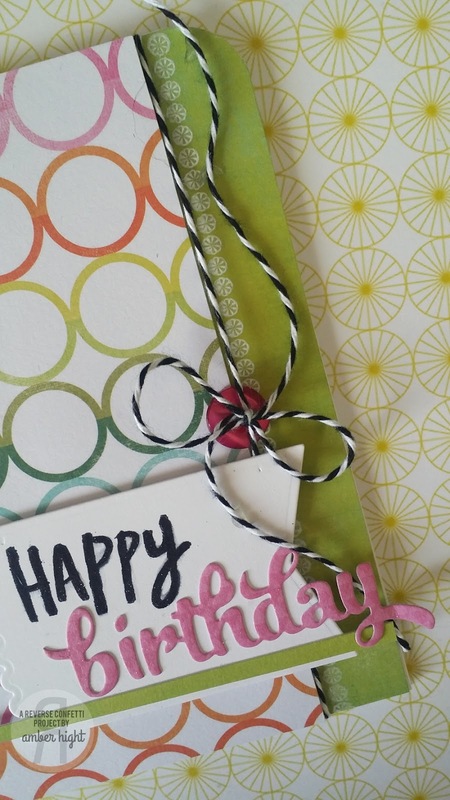 The "birthday" are die cuts from the new Fancy Words Confetti Cuts. The little white star border you see on each side of the patterned paper is from Fancy Word Coordinates! Thanks for popping by today, hope you have a great week!! April SFYTT - Hello Friend! Hi there! 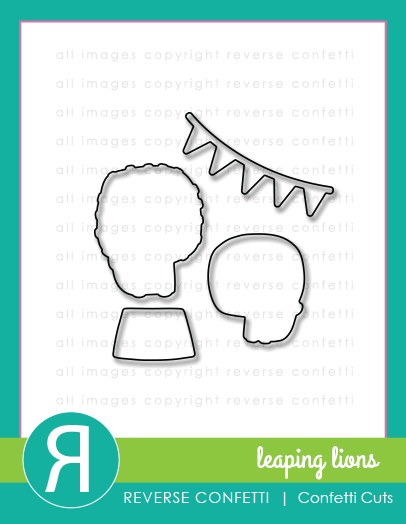 I'm here today with a card to share for this month's SFYTT, have you played along yet? Check it out!! I used a bunch new goodies on this card! 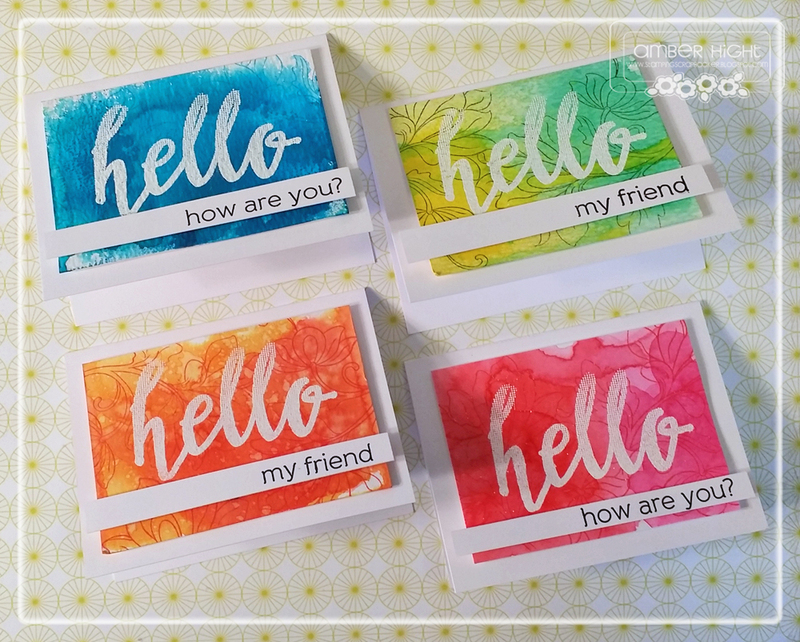 The paint swatch behind the "hello" is from Color me Happy, the "hello" is a die cut from the Hello Confetti Cut. When the card was finished, I applied some black fabric puffy paint to make it shiny and dimensional. 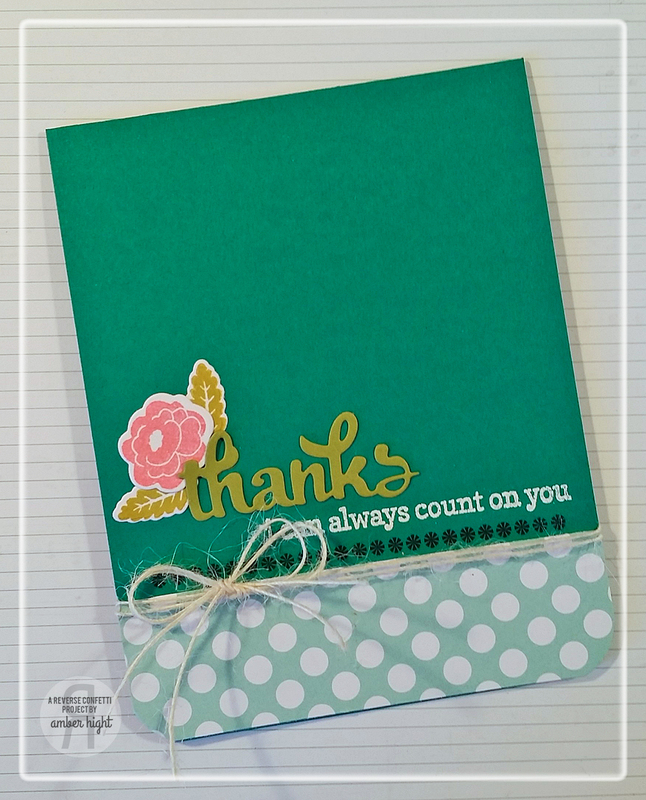 The green "friend" die cut is from the Fancy Word Confetti Cuts. The sentiment is from Fancy Word Coordinates. 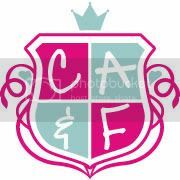 The little green hearts are also from Fancy Word Coordinates. The green border is from Wonky Double Edge Scallop Border Confetti Cuts. That's all I have today, thanks for popping in! 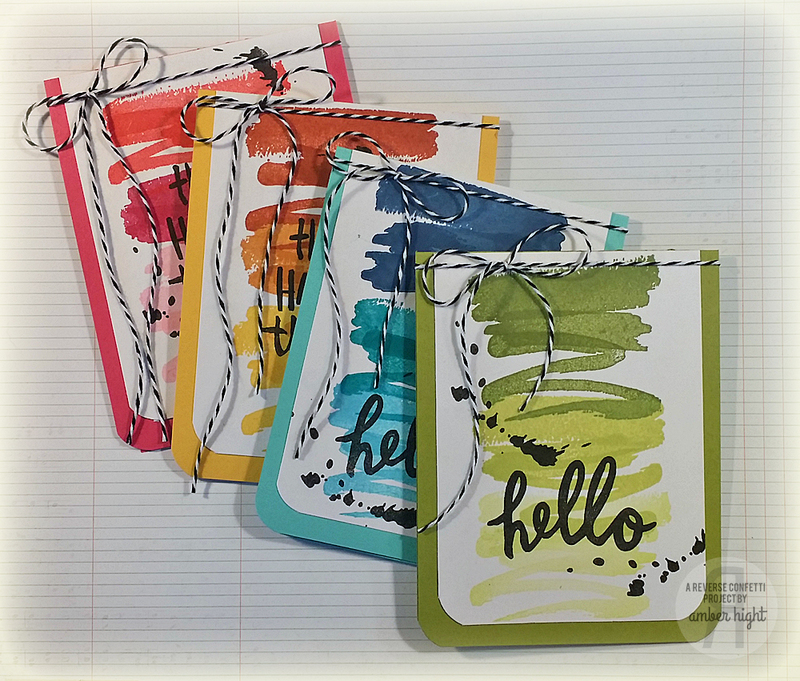 Had a little fund today creating some fun-sized note cards using a couple new Altenew stamp sets! I started by cutting four pieces of watercolor paper to 2.75 x 3.5 and then coloring them with a distress ink wash. To do this, I smooshed the distress inks onto my craft mat and then sprayed them with water. Next I took my wet paint brush and painted the color onto the wet watercolor panels. I stamped the largest bloom from Persian Motif's in a tone-on-tone color, so some of them you can see, but the flowers on the blue piece you can't see. I matched it up too well, lol! 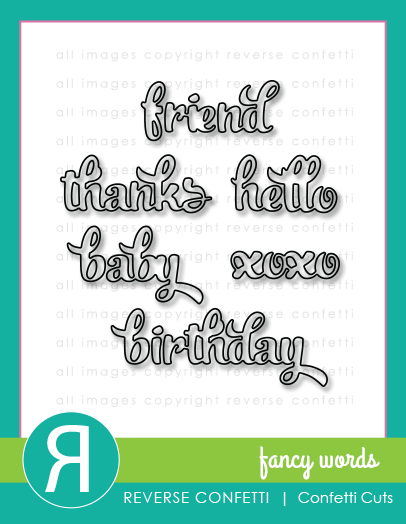 Next I stamped the hello from Halftone Hello and embossed it in white. 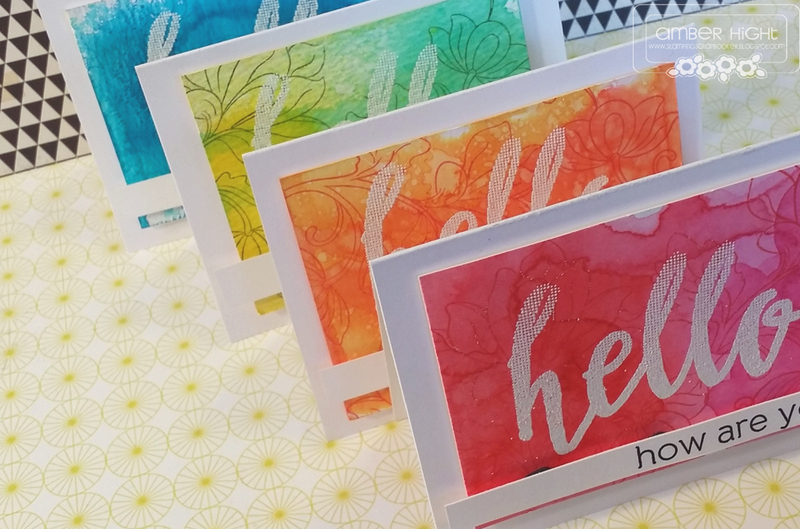 I cut out a few strips of white cardstock and stamped the sentiments (also from Halftone Hello) and then popped them up on dimensionals. 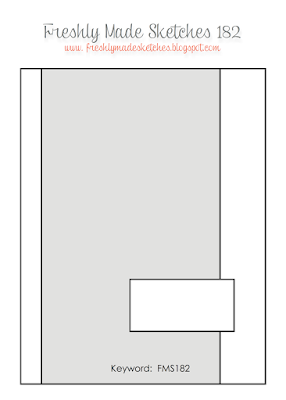 To create the small notecard, I cut a piece of white cardstock to 6.5 x 4.5 and scored it at 3.25! Such a fun little size, think I'll make more of this size! If you're looking for a little retail therapy, Vanessa is always getting new stuff in Butterfly Reflections Ink Shop, so check in often!! Thanks for stopping by and have a great Monday! Hi friends! 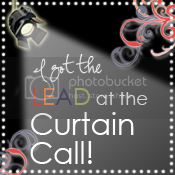 I'm up today on the Butterfly Reflections Ink Blog, come visit me!!!!! I heat embossed the "lovely" on a strip of vellum and then stamped the rest of the sentiment in Tuxedo Black ink. Using MFT's Speech Bubble die, I cut a curved white panel and stitched a piece of black striped paper just on top of it. 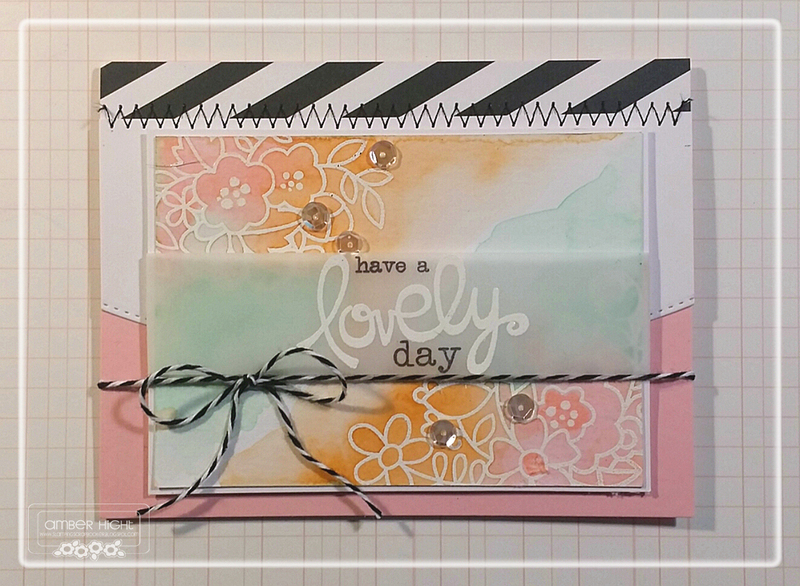 The paper is from Avery Elle's Neutral Collection 6x6 paper pad. I added my sentiment panel on foam tape, some black and white twine, some sequins, and that wrapped it up! Thanks so much for stopping by to visit today!! 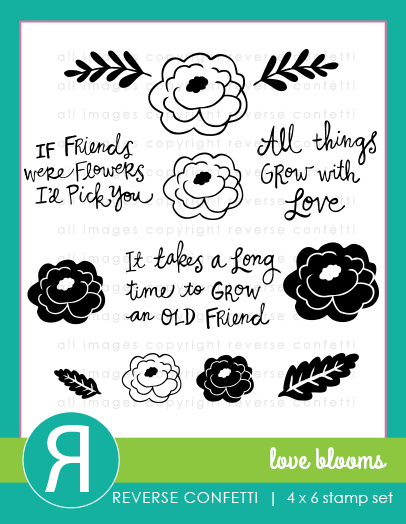 Reverse Confetti April Release Blog Hop! Hello hello!!! Welcome to Reverse Confetti's April RELEASE DAY! You MADE it, and now you can buy ALL THE STAMPS!!!!! And DIES!! Isn't this just an awesome surprise, to have a mid release-release? I love it! What is your favorite stamp set released this month? 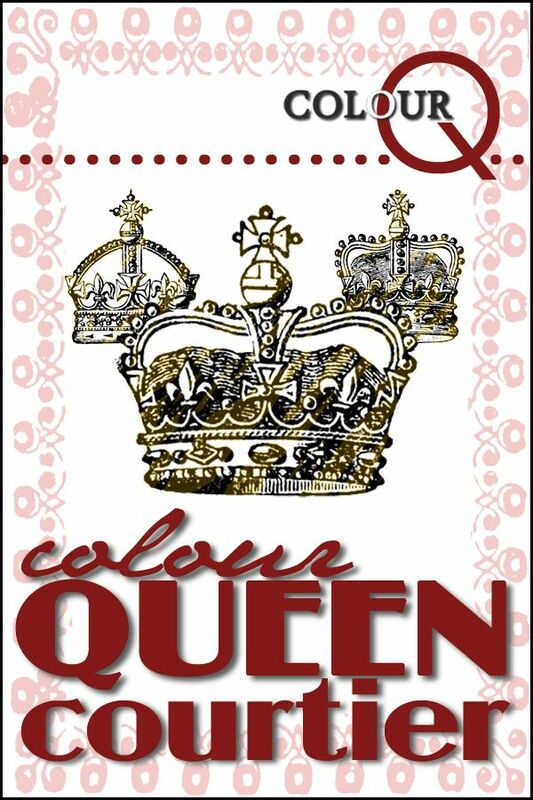 I can't decide on just one, so I'm picking Color me Happy and Shine from Within! You should have come to me from Leigh's Beautiful Blog! If you didn't, you might want to start at the Reverse Confetti Blog so you don't miss a single post! 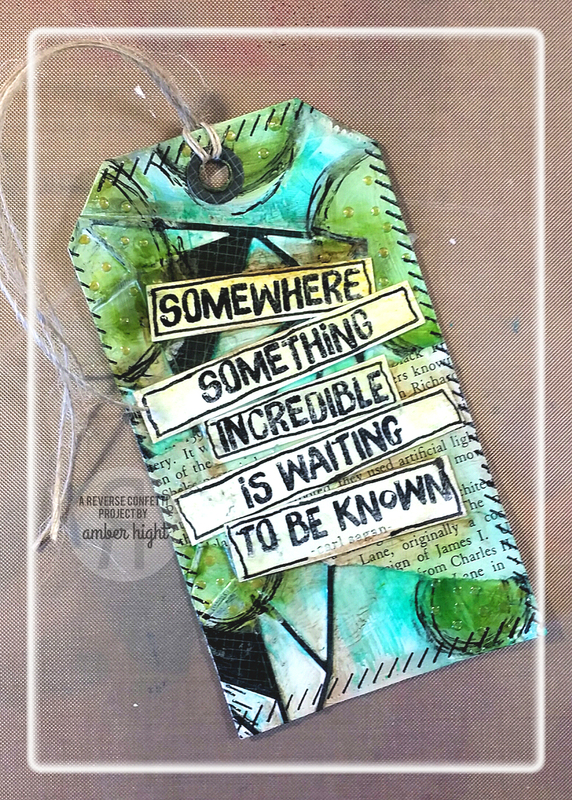 I started by painting my tag with various Dina Wakely paints. I painted some circles and blended colros with my fingers (I like to get extra inky haha), then I adhered the Geometric Background Confetti Cut panel with Gel Medium. The stitched looking edge stamp is from the Fancy Word Coordinates stamp set. Then I stamped the sentiment from Shine from Within, cut the sentiment into strips, and then adhered it with more gel medium. 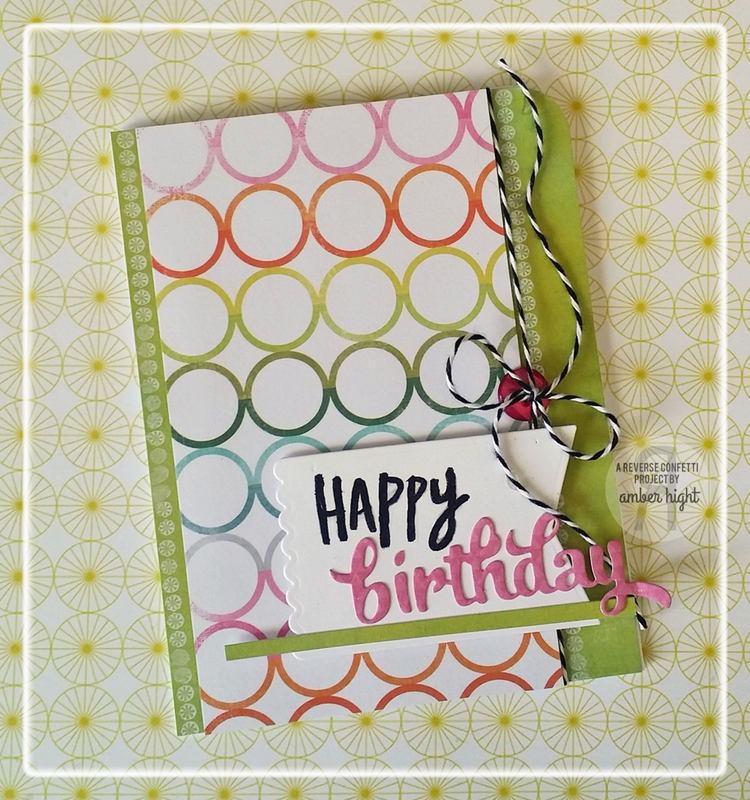 One more card I created with the Shine from Within set paired with the Color Me Happy set! The black and white piece is from the Pina Colada Quick Card Panels. 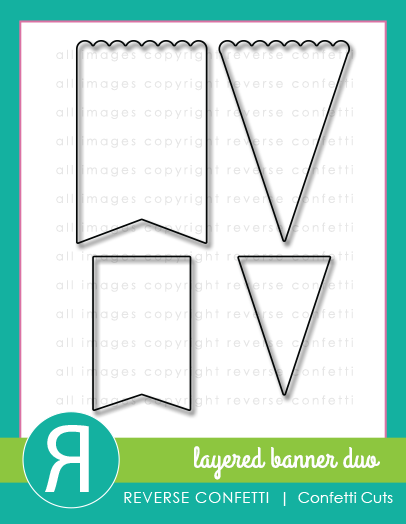 The banners are from the new Layered Banner Duo Confetti Cuts. I stamped one of the paint swatches on the pink banners the sentiment on the white banner. That's all I have to share today, hope you enjoyed my cards and are ready for more cause you're on your way to Stacey's Fabulous Blog!!! Thanks so much for hanging out with me this week, hope you come back soon! Hey there, welcome to day 3 of our Countdown to Confetti! Have you been loving the projects and sneak peeks so far? We have one more day of sneak peeks for you so lets get started! Today we're introducing a new set called Fancy Word Coordinates. 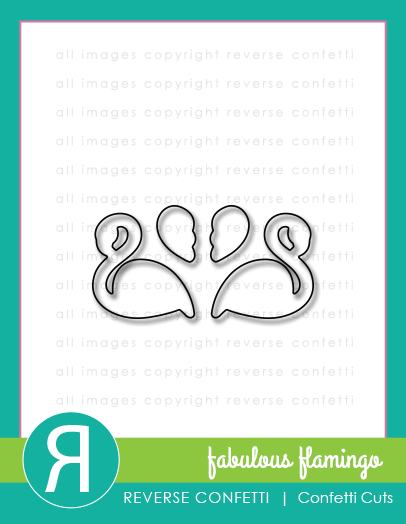 There is also a coordinating Confetti Cut called Fancy Words, comes with several fun word dies! 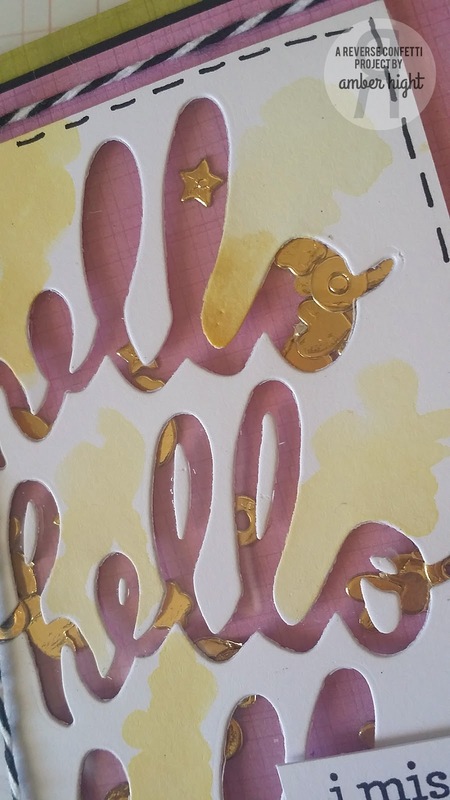 For this card, I've used the "Hello" Confetti Cut we introduced yesterday. 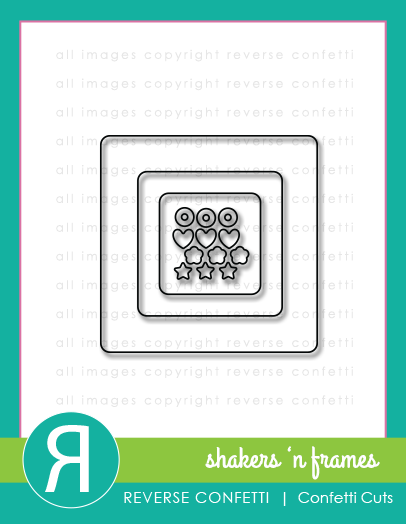 I cut the sentiment out 3 times and turned this into a shaker card! I adhered some clear acetate behind the die cut panel and then cut several faux sequins from the Shakers 'n Frames Confetti Cuts out of gold foil cardstock. 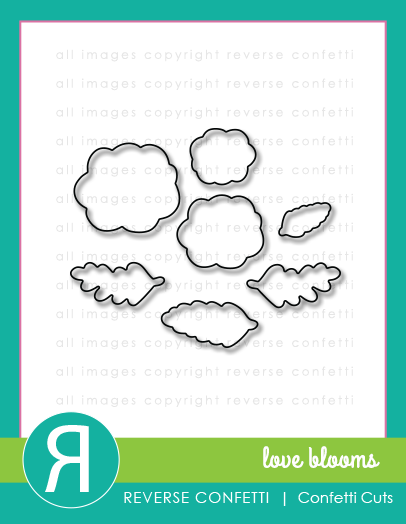 For this card, I kept it simple, and used one of the Fancy Words Confetti Cuts and also the stamps and dies from Love Blooms. 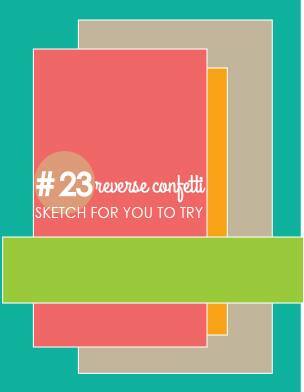 Make sure to hop on over to the Reverse Confetti blog for details on how you can win and for more inspiration! Thanks so much for stopping by today! Hello and welcome to day 2 of our Countdown to Confetti! I'm not going to lie, I'm most excited about the stamps released today, they are seriously BOMB!!!!!!!!!! First up is the amazing new Color Me Happy!! If you love paint, watercolor, or just an artsy looking card, this is the set for you!! 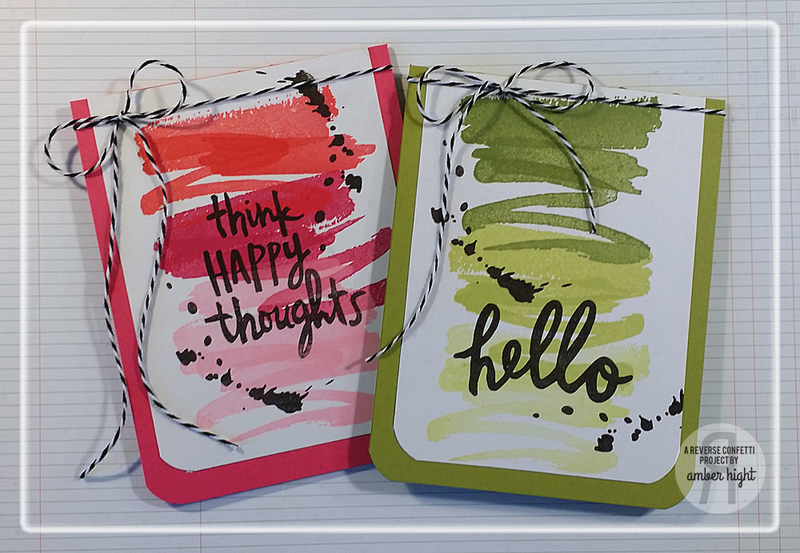 With several paint swooshes, ink splatters, and a couple fabulous sentiments, you're going to love this set! 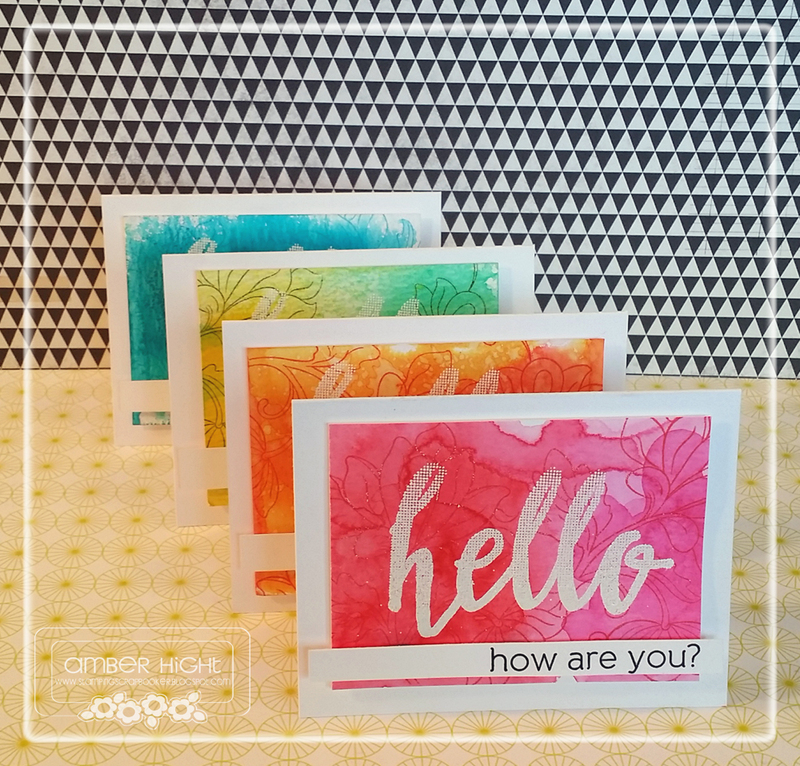 I created this super fun quartet of ombre notecards. These colors just make me HAPPY! 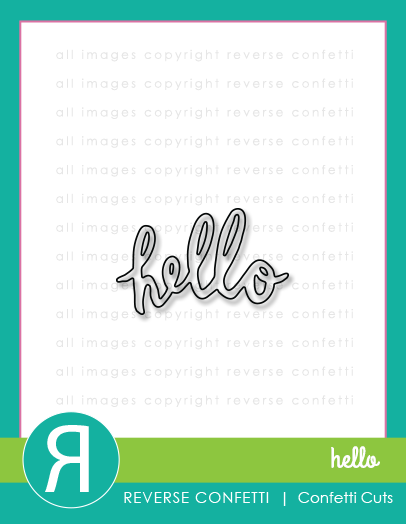 This set also has a coordinating Confetti Cut, it's called Hello and matches this stamped "Hello" sentiment! It's the perfect size to accent your cards. 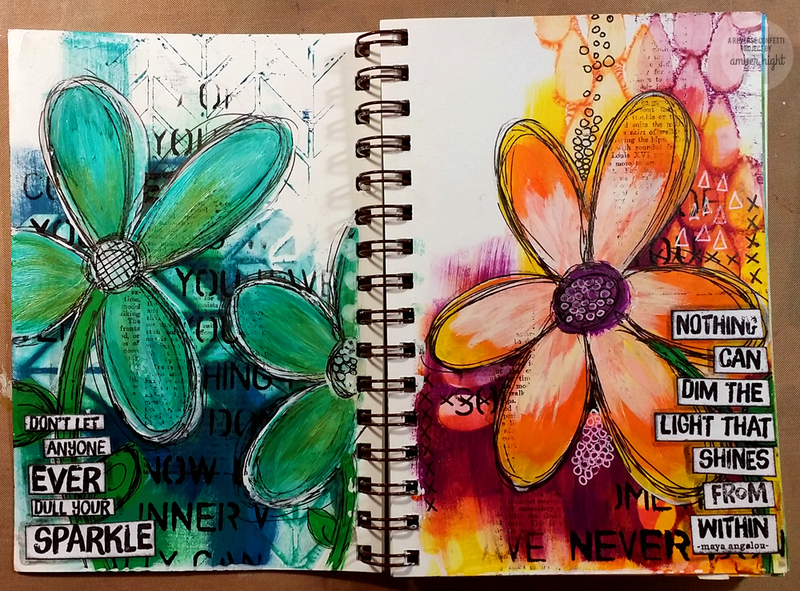 Okay, last project up today is an Art Journal spread I created using a couple quotes from the new Shine from Within stamp set. Hello, friends! Hope your weekend has been refreshing and relaxing so far! Mine has! 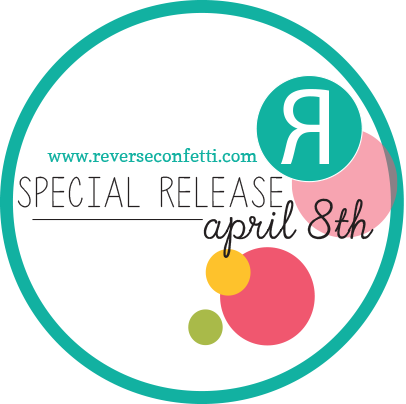 I'm here today with Day 1 of our Reverse Confetti April Release sneak peeks! Today, we're sharing peeks at two new sets! 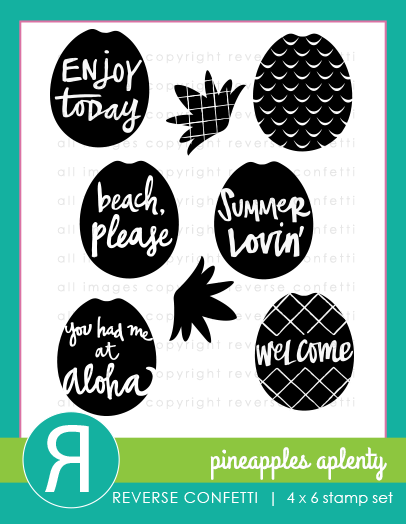 First up is the new Pineapples a Plenty set and matching Confetti Cuts! 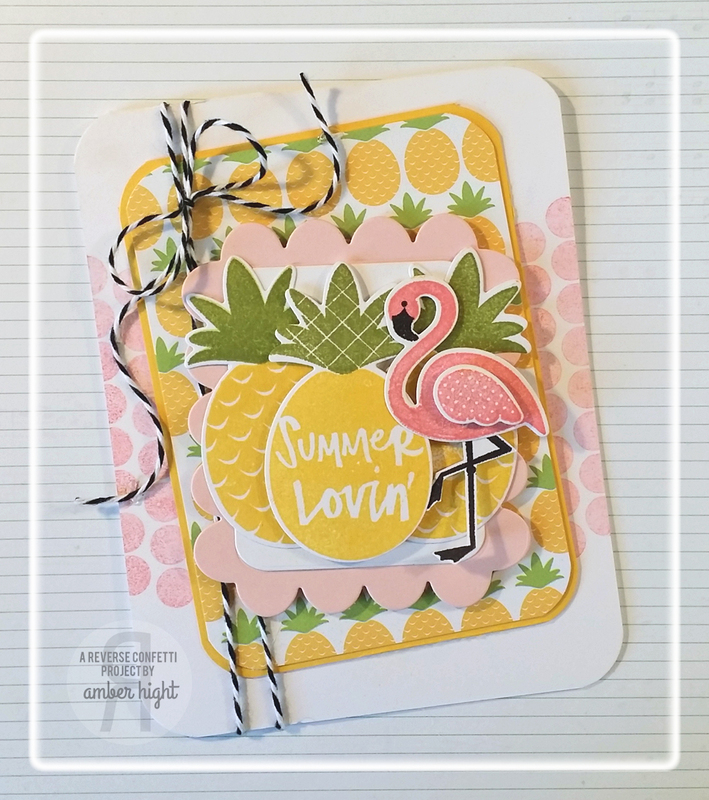 I had so much fun with this summery card! 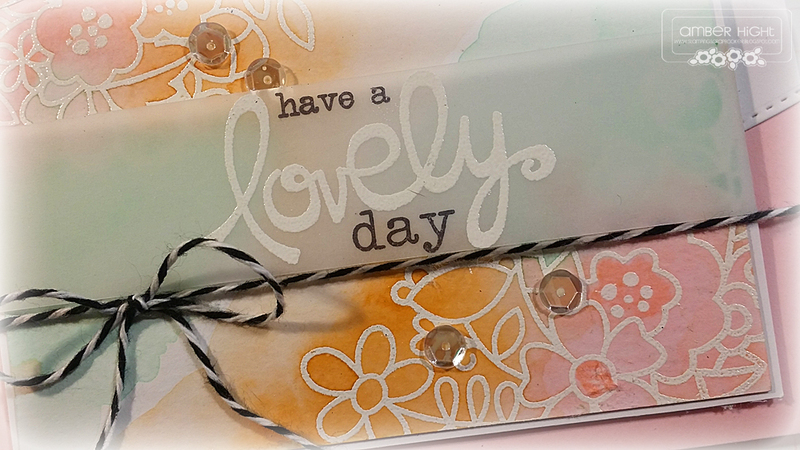 To start off, I rounded the corners on my card base and stamped some polka dots from Whole Lotta Dots in pink. 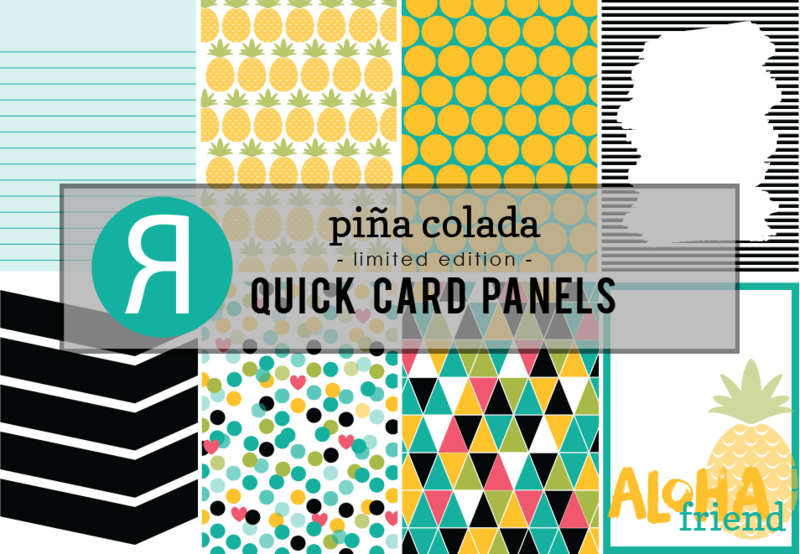 The pineapple pattern paper is actually one of the new Pina Colada Quick Card Panels! I layered it on piece of Daffodil cardstock (from MFT) and rounded the corners on these pieces as well. 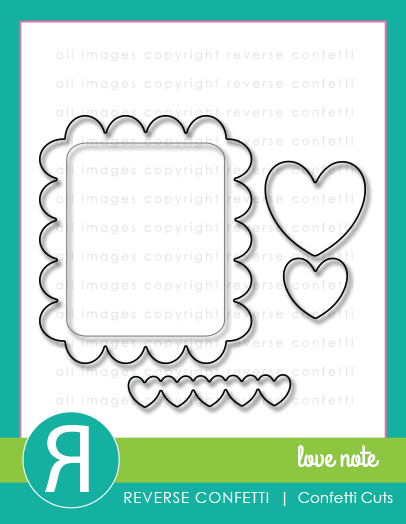 I cut the scalloped panel with the Love Note Confetti Cut out of pink cardstock, and then the rounded rectangle from the Class Act Confetti Cuts. 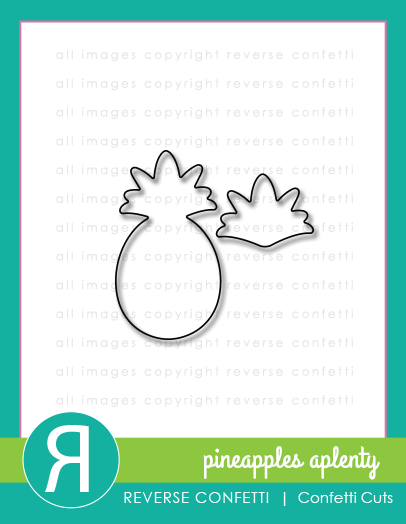 Next, I cut out three pineapples from the Pineapples a Plenty Confetti Cuts and stamped with coordinating stamps. I thought, this summery card needs something else. 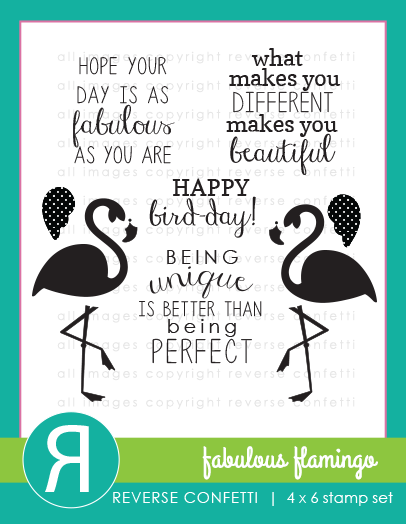 How about a flamingo from Fabulous Flamingo??? 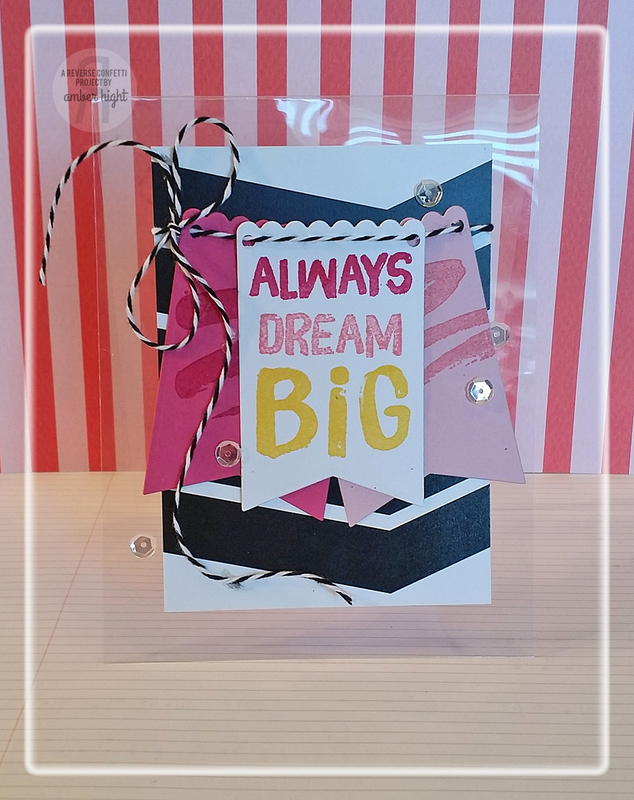 I cut it out with the Fabulous Flamingo Confetti Cuts and stamped in pink and black ink. The last touch on this card was the twine wrapped around the card front. 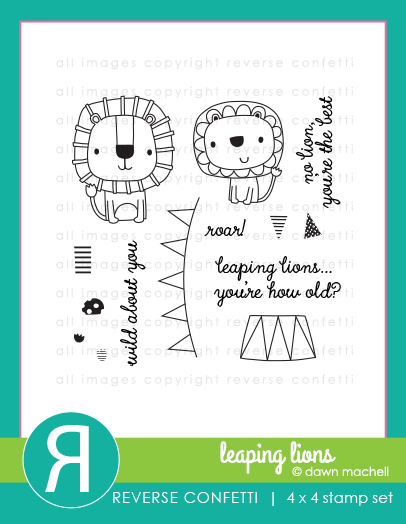 I cut out the lions with the Leaping Lions Confettti Cuts and stamped them in black archival ink. Next, I colored them with my Tombow watercolor markers. 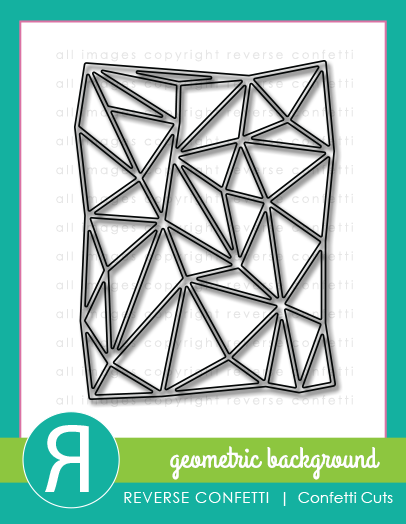 The triangle patterned paper is another card from the Pina Colada Quick Card Panels. 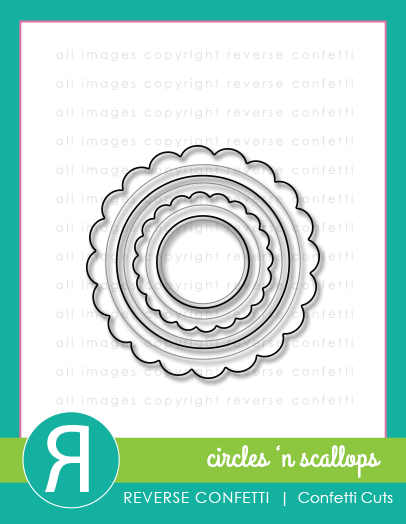 I cut a circle out of the middle of it using the largest plain circle from Circles 'n Scallops. 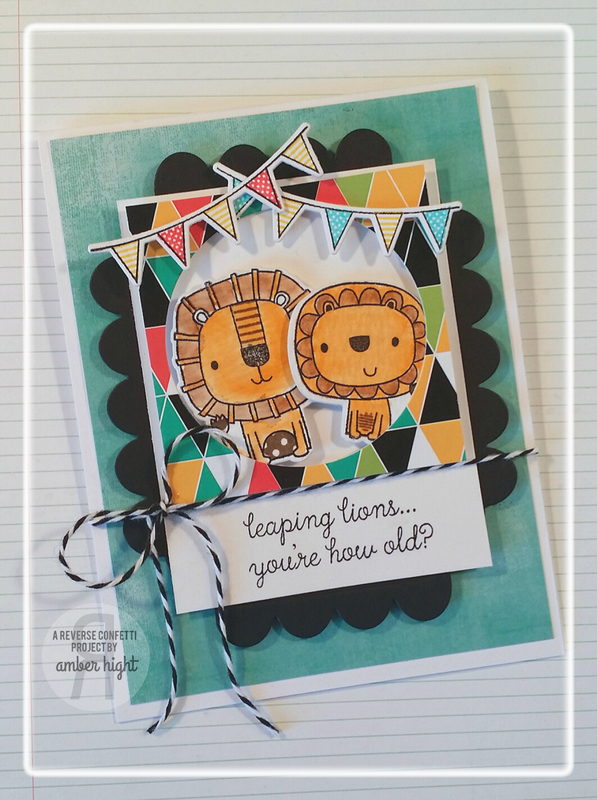 I cut a couple banners out using the Leaping Lions Confetti Cuts and then stamped the coordinating banner fillers from the Leaping Lions stamp set. The black scallops are from the Love Note die. I just trimmed it up and used it to edge the main panel. I love this sweet sentiment too, isn't it adorable??? Super fun stamp set!! 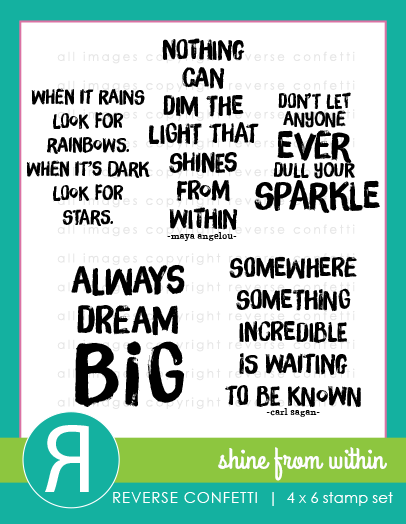 Okay then, that's all I have to share today, pop on over to the RC Blog for more inspiration!!! You won't want to miss a thing! See you back here tomorrow with more!